Mourners reach out to touch a ghost bike at a vigil for Amanda Phillips, who was killed while riding a bike in Inman Square. CAMBRIDGE — An architect from Southie brought 100 candles, tea lights in clear plastic cups. A biology teacher from Cambridge Rindge and Latin School summoned a gathering of sacred harp singers. Leaders of the Boston Cyclists Union reached out to the family of the deceased. None of them knew the 27-year-old nursing student and barista who died in a bike crash in Inman Square last week. But, as fellow bicyclists, they felt as though a cousin died, as one person put it. The bicycling community’s vigil for Amanda Phillips at the crash site Wednesday night was the latest example of an increasingly common — and elaborate — urban ritual in Boston honoring victims of fatal bike crashes. The memorials are coordinated by a private Facebook group made up of dozens of cyclists who see communal mourning, and the resulting protest against unsafe streets, as a sacred responsibility. 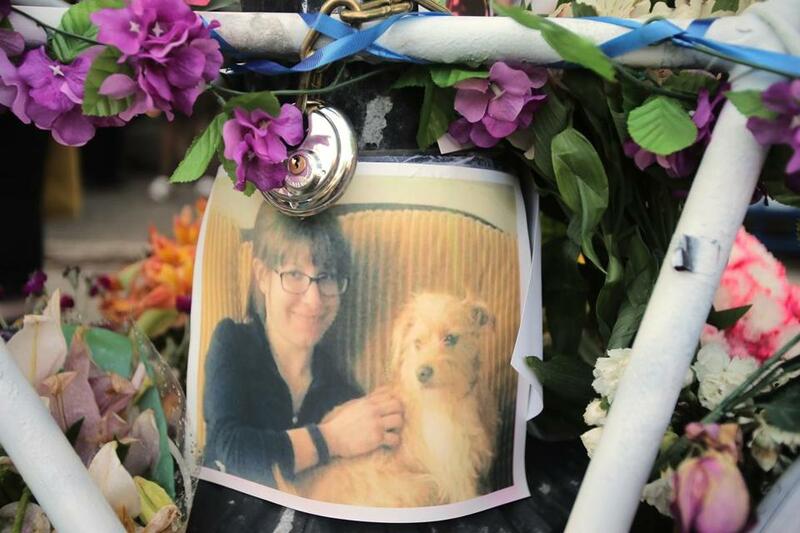 Since Marcia Deihl, a Cambridge songwriter and activist, was killed on her bike in March of last year, the group has put together four memorial vigils. Friends and family often come, but many of those who attend are bicyclists who want to share their grief and what Everett calls “righteous anger.” They hope drawing visibility to the tragedy will encourage drivers to be more careful and persuade public officials to make roads safer. The death of Amanda Phillips highlighted the dangerous and confusing road configurations in the bustling area. 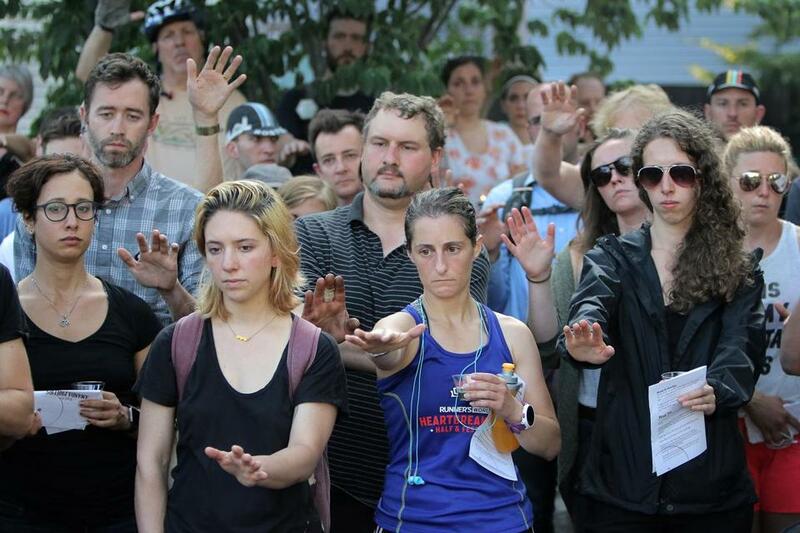 “The hardest part of all of these is that every single one of these [deaths] was preventable,” said Jay Morgan, a cyclist who was working at the 1369 Coffee House in Inman Square when Phillips was hit last week. Police said the investigation is ongoing and no charges have yet been filed. City officials are fast-tracking improvements to the intersection where the crash happened. It has become a longstanding tradition in Boston and around the world to install ghost bikes — stripped-down bicycles spray-painted white and locked to a signpost near a fatal crash — to mark a cyclist’s death. Since the early 2000s, the ghost bikes have often seemed to pop up organically, with little planning. But for more than a year now, the closed Facebook group —begun by Peter Cheung, a Jamaica Plain video editor who leads the Boston Bike Party ride each month — has helped plan the making of the ghost bikes and the memorial services. 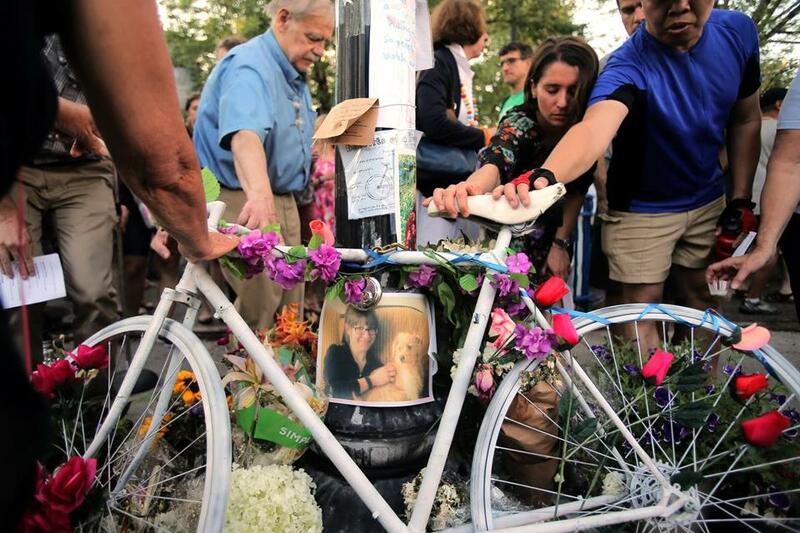 Jonathan Fertig volunteered to paint the ghost bike for Anita Kurmann, a surgeon killed last summer in an intersection — Massachusetts Avenue near Beacon Street — that Fertig passes through each day on his commute from Dorchester to Cambridge. Painting the bike turned out to be much more emotional than he expected. Kurmann’s ghost bike is still there, but the one dedicated to 18-year-old Fritz Philogene, who was killed by a drunk driver while riding his bike in Dorchester last year, was swept aside with no warning, said Noah Hicks, a bicyclist and bike shop entrepreneur who helped coordinate Philogene’s memorial. Hicks asked the city why it was removed, he said, but never got an answer. The ghost bike dedications, he said, are a unifying force in the city. “It’s one of those things that really pulls us together, people who share this common experience of trying to get around the city safely on their bikes,” he said. About 70 Boston cyclists turned out to a ride of silence last week honoring the victims of a crash in Kalamazoo, Mich., that injured four riders and killed five. Shortly after the ride ended, they learned of Phillips’s death. The Facebook group, as it turned out, did not have to make a ghost bike for Phillips, a nursing student and a barista at Diesel Cafe in Davis Square, an epicenter of bike love. 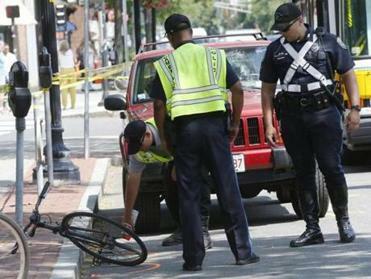 One appeared at Inman Square within a day of the crash that killed her, cyclists said. No one is quite sure who made it. “It was there so very fast; it was kind of shocking,” said Jon Ramos, an architect who lives in South Boston and has worked on past memorials. At the service Wednesday for Phillips, there were backpacks and briefcases, tattoos and tattersall, straw hats and cycling caps and bike helmets of every description. A slight breeze stirred as dusk approached. “We are gathered here today to dedicate a ghost bike, a visible sign of an invisible reality — that we are fragile humans, only here for a little while,” Everett, the minister, began. The noise of traffic rushing past sometimes made it hard to hear her, as if to testify to the power of the cars and trucks. Everett’s service sounded more spiritual than religious. “You are welcome here whatever you believe,” she said. Then everyone raised their hands to bless the ghost bike. “May all who look upon it be reminded of the awesome responsibility of driving cars and trucks,” Everett said. When the service ended, those with candles placed them around the bike. Many people touched it, some murmuring a prayer, others kneeling before it and reading the notes. But a 15-year-old boy was hit in Dorchester on his bicycle that very afternoon, suffering serious injuries. A picture of Amanda Phillips was visible within the frame of a ghost bike at a vigil for her in Inman Square. Lisa Wangsness can be reached at lisa.wangsness@globe.com.